Halloween Week - 10 More Halloween-y Reptiles ! Happy Halloween my lovely fellow reptile lovers! We hope you have a very fun, very safe (!!) Halloween this year! We’re finishing off Halloween week the same way we started it – with some more very Halloween-y reptile photos! Haven’t seen the first article yet? Click here to go check that one out too. And now, on to the photos! This Halloween-y Slider Turtle is the Queen of all the pumpkins! Complete with some spooky little (fake!) flames, we think this is an adorably spooky photo. In this photo a beautiful crested gecko is chilling on a pumpkin, next to a very cool looking bottle. Definitely a very Halloween-y vibe! 3. Blue Tongue Skink Likes Pumpkins! This blue tongue skink from the Smithsonian Zoo shows off it’s brightly coloured tongue while chilling half in a pumpkin! 4. Monitor Wants Both Of The Pumpkins! This beautiful monitor is claiming both of these pumpkins for himself, he doesn’t want to share with anyone else! This is one of our crested geckos JD, and he’s just hanging out on a skull with a very Halloween-y looking decoration surrounding him. Call us biased – but we think that this photo is adorable! 6. A Big Scary Dragon! This adorable Bearded Dragon is dressed up as a dragon and wearing a super cool set of wings. He’s even perching on top of a skull, which we have to assume was one of his defeated enemies. This gorgeous Eastern Kingsnake at the Smithsonian Zoo decided to chill inside and around a vampire pumpkin! Making this a very spookily cute photo! 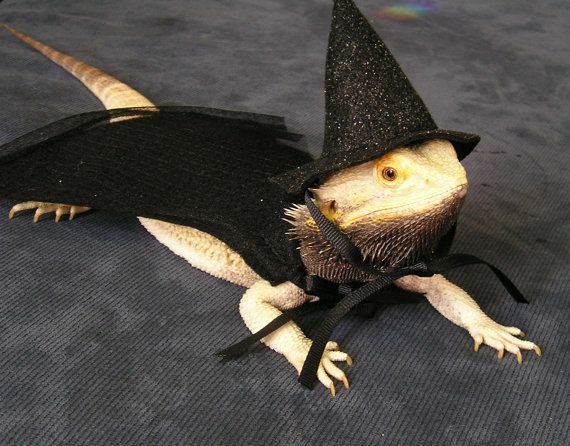 This bearded dragon dressed up as a witch for Halloween. Not only is this an adorable costume, but this beardie definitely pulls it off! In the first article we had a pumpkin turtle, and this time we have an oh so scary turtle shark! Hopefully he doesn’t bite! All jokes aside the time put into making these little costumes is inspiring. 10. Iguana Or A Taco? And to finish off this article, and Halloween week in general, we have a photo of an Iguana Dressed up as a taco. This big guy fit into a dog costume, and we definitely think he pulls it off! Enjoy this article? Share it with your friends using the links below! Also, leave a comment below and let us know what you think. Thanks for reading!